I enabled SSL on the Silvabokis website on October 12 2017. 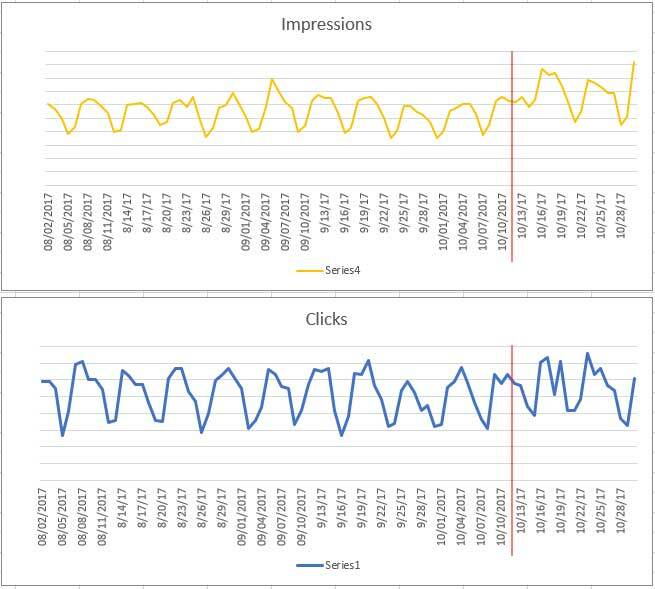 Within days Google Search Console showed a significant 25% increase in Search Engine Results Page (SERP) impressions and a 6% uplift in clicks from Google search to the site. Why did I decide to switch on SSL now? A boost in SEO wasn't my main reason for enabling SSL. I was actually heading off future traffic losses and site abandonments that will be caused by upcoming changes that Google and others are making to web browsers and search algorithms. What are Google and others doing that could damage traffic to non-SSL sites? Unsecure (non SSL) websites will be penalised in search results if the site contains forms or other features that would result in data being transmitted in an unecrypted format. In addition, Google has announced that their Chrome browser will soon warn visitors that sites delivered over http are "Not Secure". The first point above means that http sites will lose visitors compared to their https rivals. Equally significantly, those people who do visit an http site will be clearly told it is Not Secure - this must surely cause an increase in the number of people who abandon the site due to security fears. Should you flip the switch in your Squarespace site admin system and enable SSL immediately? Not quite immediately. There are a few things you should check first. If your site has FRAMES or other embedded content where the URL is http rather than https the iframe / embed won't work on an SSL site. You'll need to contact the people who own the embedded content to find out whether they have secure, SSL enabled, URLS for you to use. If you're using third party scripts or fonts that have http links you'll need to update the links to https and you may also need to make changes on the font / script owners website in order to white list the https version of your site. If you've uploaded files such as images, PDFs, word documents and linked to them either from scripts, custom css areas, code blocks and the like they could well have an http link rather than an https. You should be able to change these from http to https. The list above covers the most common problems when migrating your Squaresapce site from http to https. Once you've tackled the above you should be good to enable SSL. The first thing to do is thoroughly test your site just to ensure that everything is working as expected. It's possible that you missed a few references to insecure resources in your pre-switchover checks. If you're using Google Search Console you will need to create a new profile for the SSL (https) version of your site because the insecure version will stop tracking.